Last week, before the school year begins. I've been awakened at 6am the past two mornings with incessant construction hum. Landscape crews are dropping off dirt and leveling the place. Spoke with Paul McDonell last week, lead architect for the Board of Education and spoke of this newly renovated school as the crown jewel in the district. So many little pieces falling into place right now. Amazing buzz all weekend with administrators, staff and teachers doing logistics. 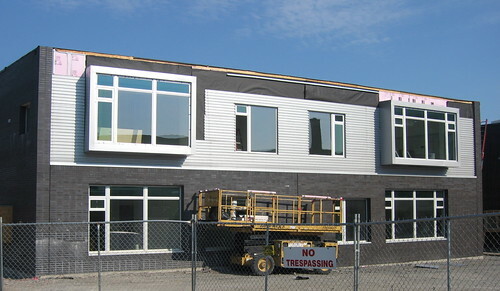 This is the front of the new school, along Ferry Street, one of three new additions to the school. The other two additions include the art and science wings. 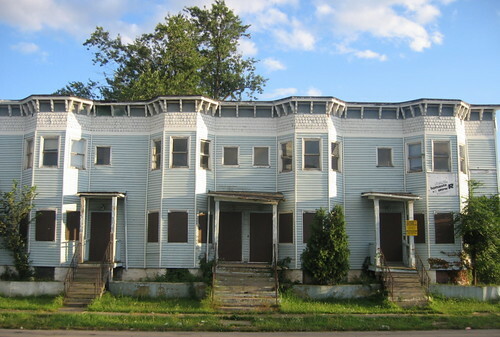 One of the many reasons why I started blogging, three years ago, was to trace the "demolition by neglect" of the City owned Woodlawn Row Houses, a local-landmark that was literally hidden in plain sight on the City's near East side. 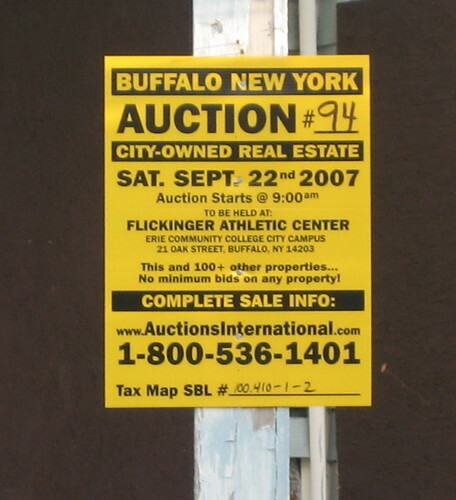 In April of 2004, I asked John Hannon - Division of Real Estate - to rescind the sale that City entered into during another special real estate auction, in 2003. The $7000 offer was accepted and the guy, after three seperate extensions over a 13 month period, was never heard from again. Lots has changed here locally since then. The Mayors Anti-Flipping Task Force has gotten some traction - see St. Matthew's Passion - and the politics of housing in the City, lead in part by the amazing folks over at PUSH Buffalo and LISC Buffalo - see, Getting Smarter about Decline has expanded and focused our our understanding of the vexing neighborhood issues. In September Auctions International will be conducting another special auction. Fingers crossed that the expected 250-300K necessary for the restoration of the Woodlawn Row Houses somehow materializes this time. I'm planning to attend the auction and will follow post auction activity, too. Additionally, one of my favorite buildings on the City's East side, near my favorite intersection - High and Genesee - is on the auction block, too - 630 High. Returned to Sickamore Village recently. So many questions. Additional background and links to site plan, here. For starters - why more houses? Buffalo is a shrinking city. Some of the most astute observers of Buffalo's malaise and housing crisis have drawn a positive correlation between new builds on the City's east side and people leaving Hamlin Park. This amounts to a very expensive game of musical chairs. There are/were a number of very solid houses on this block that have been demolished recently, including this one at the corner of Mortimer and Sycamore that I featured last summer in this post - Greening of Buffalo - less than a year ago, in September. We are simply imitiating failure at this location. Urban is urban and suburban belongs, well somewhere else. From a design and planning perspective this project is not urban. It's part of the subtle shift to suburbia and away from what makes a city work. There's a foreclosure problem with many of the houses surrounding this new development, too. Some of the recently built vinyl victorians have been re-selling at less than half their original 90K selling points. Developers skate and the promise of neighborhood stability remains a mirage. And the site is wide open. No barricades or construction fencing. Why? So what's the cost? No one knows the true cost, yet word is that each one of these "vinyl victorians" is priced around $235, 000. With a developer subsidy of 100K they'll sell for $135, 000. Plus, factor in the cost of site remeditation - the construcition and demolition of the three houses - and the infrastructure that includes new sewers, new street and new sidewalks. 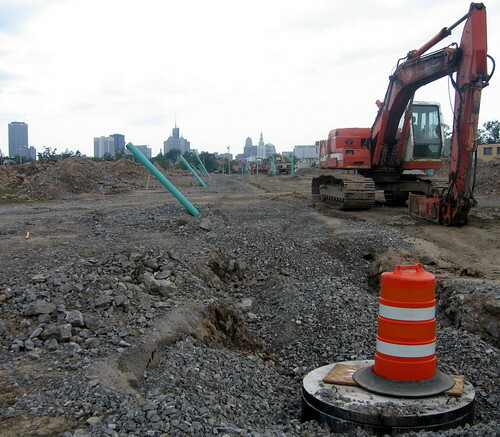 Any time a municipality forces development on remediated land, look out. Run. Love Canal, Hickory Woods? Should have left it looking like it did last year, right here. Have we learned our lesson? Probably not. update - 8/28/07 11am Conversations this morning indicate that the 25 homes scheduled for this site weigh in at $265,000 with a subsidy of $75K and homeowner incentive of $25K. The actual cost, when you internalize the 1.3 million remediation that took place, late 2006 brings the cost of each 1800 sft piece of suburbia with an attached 2 and half car garage much closer to East Amherst than what would work for the City's East side. ROI? None. Taxpayers will be subsidizing this forever. During the tour Saturday morning of the Artspace Backyard Neighborhood, we quickly noticed this sign posted at 1042 Ellicott Street, around the corner from Coe Place. Here's the Auction International site where you can check out the two online catalogs of real property the City is selling, 102 properties. Terms of the auction are right there, too. First mentioned 1042 Ellicott back in February, right here and posted an interior slide show, too. Outstanding house and great location. Just read through the Auction International site for the Buffalo auction on September 22. A few surprises including 16 Harwood and 204 High Street. Despite the announcment by former Common Council President Jim Pitts that he was intending to purchase this local landmark, the Woodlawn Row House are included in the auction, too. Wrote about Jim's plans here - Saved! - just two months ago. Will be watching this closely. Was a top City Hall the other day doing tours and noticed Sickamore Village off in the distance, that brown spot slightly left of center. Wrote about Sickamore Village and the more I learn about the place, the less I think we have learned from our mistakes in the recent past. Longer post later this weekend, when I scoop in for some close-ups of the work site. Just when you think you know what makes cities tick, something changes - population, the economy, technology. So the question, what makes cities work, never gets old. And it's never been more important. Ken Corey and Mark Wilson have taken a deep look at the global knowledge economy, how it is reshaping cities, and how urban planners ought to respond. Ken and Mark are co-authors of Urban and Regional Technology Planning: Planning Practice in the Global Knowledge Economy. Jay Walljasper takes a more down home approach, urging all of us to get out and "do it ourselves" when it comes to improving the places we live. Jay is author of The Great Neighborhood Book: A Do It Yourself Guide to Placemaking. Think Craig Reynolds from Soundlab is on to something and would encourage all fixBuffalo readers to read and then re-read his short piece How Buffalo Get a Warhol that first appeared in 1997. Pass it on to your friends in Brooklyn or Berlin. Then ask...Why not Buffalo? Let me know what your hear and make sure to check out what's coming up at Soundlab - here. The following was sent to me early this morning and appears on the Illuzi Letter, which is not one of my usual reads. A reporter pays a visit to Buffalo City Court Judge Henry Nowak's Housing Court and is surprised by what he finds. Instead of a long line of home owners whose houses need work to pass inspection, what he finds is a long list of home owners being foreclosed on by out of town financial institutions such as Wells Fargo and Deutsche Bank. In fact, its the local version of a syndrome which has seen foreclosures increase in many parts of the nation. Even more interesting, it's appears to be a symptom of a disease which is a big part of the reason for the head cold currently afflicting Wall Street. 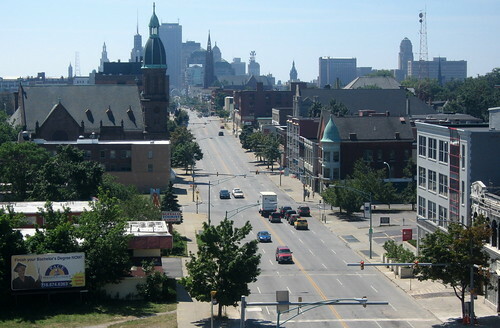 According to Executive Director Aaron Bartley of PUSH Buffalo, it's all part of a get rich quick scheme being resorted to by Wall Street firms which can inflate bottom lines temporarily while it devastates cities like Buffalo. time paying," Bartley explains. 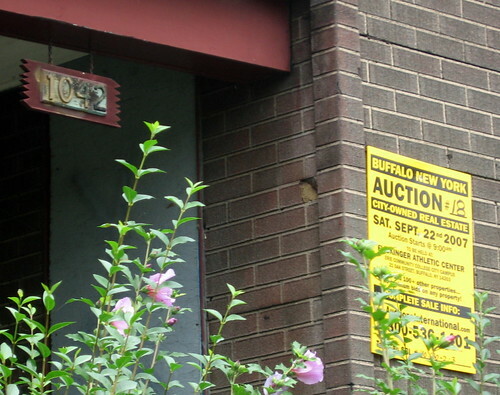 "Then they foreclose on the properties when these people can't pay and then they abandon the properties, adding to the roster of totally neglected homes in a city like Buffalo." "This is the cause of much of the instability you are seeing on Wall Street," Bartley explains. "These firms are selling bonds that are worth little or nothing, leaving investors holding the bag, which in turn, leads to inflated stock values which soon plummet." 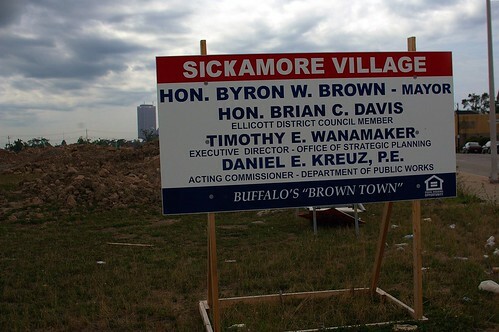 Meanwhile, back in Buffalo, these shenanigans have led to a crisis in some inner city neighborhoods which have seen whole blocks of homes foreclosed on with no end in sight...at least until recently. "A recent ruling by Judge Nowak has the potential to stop this nonsense in its tracks," says Bartley. 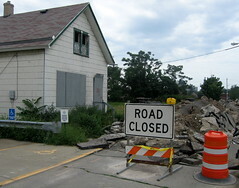 "Judge Nowak ruled that a bank can not foreclose on any property in the City of Buffalo if that financial institution has outstanding judgments against it for non-payment of fines related to neglect of the properties it already controls...Clearly, this decision, if it's not reversed, will force this firms to at least maintain these properties or else not beso eager to foreclose." Currently, Bartley and his number two, Eric Walker, are looking this issue to see what companies such as Wachovia and Fargo are doing with all these properties that are falling into their hands. we'll let the community know." I understand that Judge Nowak - Buffalo's next mayor? - will be presenting the Deutsche Bank case during one of the sessions at next month's Reclaiming Conference in Pittsburgh, sponsored by the National Vacant Properties Campaign. If you want to put your finger on the pulse of the most amazing set of issues impacting our cities, check 'em out. Conference schedule - right here. 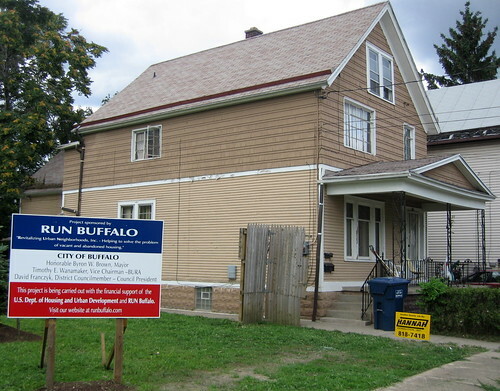 Simply put, RUN Buffalo will help clean up and beautify city streets through demolition of worse case uninhabitable residential properties that are beyond repair, vacant properties that pose a threat to the safety and stability of many at-risk neighborhoods, property with no economic or historic value to the city or the community. 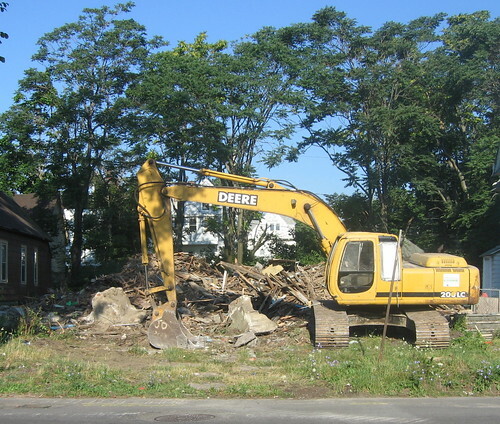 Following demolition, an army of` volunteers will create and maintain a natural landscape on the property until the community determines an alternate use will better the serve both the city and the neighborhood. And a pic of the before and after on Detroit St. The third stage of this summer's Tour d'Neglect is complete. After three hours of meandering through some of the East side's forgotten Catholic complexes we returned to the Sonic Café. Eight of us pushed further and visited the Queen City Farm site on East Utica. Catch the last tour on Sunday September 9th - leaving the Sonic Café at noon. Noticed that Peter Koch over at Artvoice gave the tour a thumbs up - right here. The following posts and pics chronicle some of ebb and flow of one of the East Side's more promising community based organizations - Buffalo ReUse. Stop by next time you're shopping for building materials and items around the house. And please consider donating building materials from your renovation projects. The Landmark Society of the Niagara Frontier has recently digitized the pages of James Napora's Houses of Worship. This is the most complete examination of extant church structures in Buffalo, NY and is part of Jim's unpublished 1995 Master of Architecture thesis. Napora writes, "The purpose of this work is to analyze the religious structure and its place in the architectural history and the development of the City of Buffalo. The place of worship has long been viewed as a critical landmark in its respective neighborhood, serving an importance which far outreaches its religious ties. This work examines the religious structure in the context of the distinct districts through which the city has grown and expanded." Houses of Worship is definitive and represents countless hours of research. 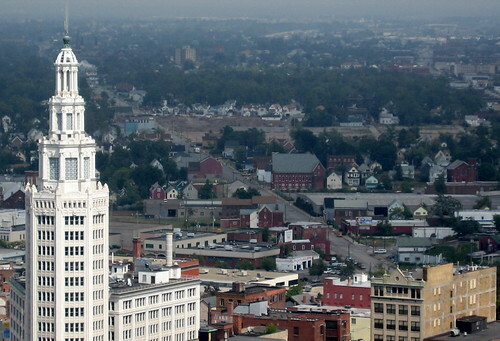 Check it out and understand Buffalo's massive cultural heritage. 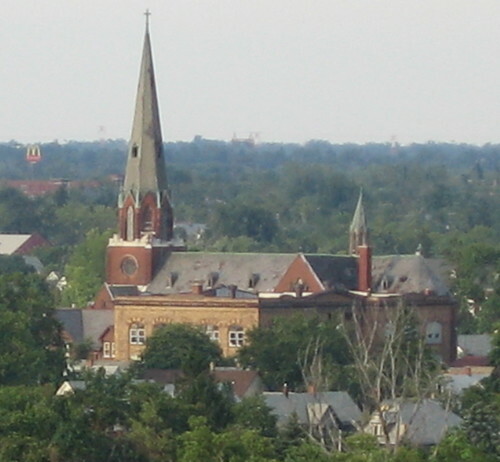 Napora's work provides the basis for establishing an index and inventory of Buffalo's threatened religious structures. 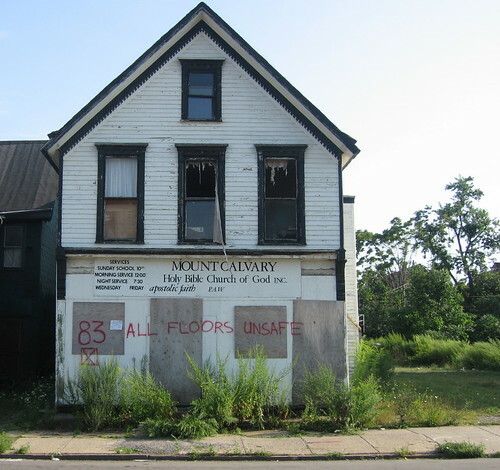 First mentioned this city owned house and former church at 83 East Utica back in February - City Church Closed. Snapped this pic the other day. The red mark of death - spray painted address - generally means the property will be demolished at some point down the road. First time I've seen the structural condition of the building's interior sprayed on the outside. The exterior sheet metal skin is now being installed on the six back buildings over at Artspace. While corrugated building products are not allowed in the City, according to the building code, HHL Architects have successfully renamed this product. It's now called - undulated panelling. All six buildings in this phase of Artspace can be seen in the this gallery, third pic. And in other Artspace news seems like the run up to rental is being hit with a few glitches. Heard from some artists that some straight section 8 tenants are moving in which seems to be confirmed by some of Belmont's own sales literature. Here's the sales flyer [.pdf] right from Belmont Shelter, property manager for Artspace. fixBuffalo readers no doubt have been following the trials and tribulations of Buffalo's Control Board Treasurer, Rev. Richard Stenhouse. I caught this letter in Tuesday's Buffalo News from Rocco Termini praising Rev. Stenhouse and taking a swipe at me. If the issue was as simple as Rocco Termini presents it, I'd probably agree. The larger issue and for some reason skirted by Rocco Termini is simple. Phone calls - from City Hall to Rev. Stenhouse - do not resolve issues impacting public safety. 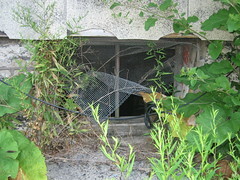 Enforcement of the City's building code brings compliance. As I've documented, since January 2007 - see Boarding Control - the single largest owner of blighted property surrounding the new $30m permanent home of BAVPA is Rev. 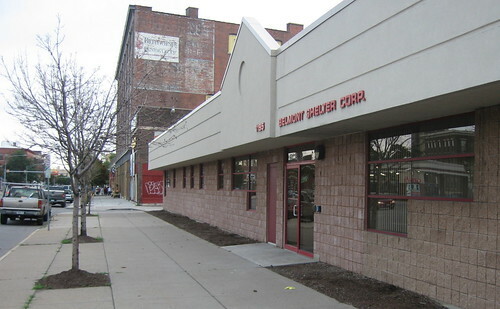 Stenhouse's Bethel CDC. He's simply failed to secure the property. Acting on an anonymous tip, city inspectors visited the empty homes earlier this year and found more than two dozen violations. The problems ranged from decaying walls and roofs, to missing steps and loose railings...Nowak directed parties to return to court Sept. 19. The judge also stressed the importance of making sure all doors and windows in the vacant homes are sealed pending demolition. I met with Rev. Stenhouse in front of his properties late last week. He assured me that they'd all be demolished prior to the first day of school across the street at BAVPA's new home. New fixBuffalo fan and I paddled part of the Buffalo River Sunday afternoon. Second time here this summer for me - see, Down by the River for views from late May this year and links to previous water exploration. As we approached the Erie Canal terminus and the Commercial Slip we noticed a string of silly looking lighthouses that were installed on the new floating dock here at the Central Wharf. We tied off the canoe and explored the site. We wagered what sort of progress will be made by next summer. Gotta leave it to others to figure out if the wee little lighthouses are historically correct or should be grouped somewhere with other forms of nautical kitsch. Best Buffalo grain elevator map - right here. John McClive from Rotary Buffalo recently asked Rod McCallum and myself to speak at the regularly scheduled Thursday lunch meeting this week. We'll be showing the Queen City Farm film by John Paget and have invited a number of people appearing in the film including Cynthia van Ness, Tim Tielman, Samina Raja and Aaron Bartley. The Queen City Farm initiative is a bold statement and challenges us to re-think issues involving city land-use planning on a number of levels. In the larger context of the hollowing-out of rustbelt cities ringing Lake Erie in particular, I think that this project is 'bout as good as it gets. The alternative of course is more of what Elena Buscarino has begun to document over here in her Death and Destruction Tour. Seeing that slide show and listening to Elena's interview with Michael Clarke and Anthony Armstrong from LISC Buffalo is one thing, checking out the neighbor first hand is way different. If you're interested in meeting Rod McCallum and joining us at Thursday's Rotary lunch, let me know. Meanwhile get ready for Saturday's Tour d'Neglect. We'll be passing by the Queen City Farm site and seeing many of the houses that Elena presents in her slideshow. Crews and school staff have been working weekends recently to meet the September deadline. Yesterday morning I was awakened to the cacophony of construction vehicles dumping load upon load of fill and top soil preparing the area in front of my house for landscaping. The big green fence is finally down that surrounded the parking lot. For my 11 years here, this mangled cyclone fence has served as both physical and psychic barrier in the neighborhood. Added a two ton concrete cube to my side yard this week, too. More about this concrete art project in a few weeks. Noticed that Belmont Shelter is loosening it's grip. The security bars on all their windows were removed late last week. In Buffalo, Belmont Shelter processes lots of section 8 rental vouchers. The value of these vouchures in a rental market like ours no doubt contributed to the building's security. Belmont still has the secured perimeter fence around their parking lot. Here's the pic from the roof next door at Artspace. 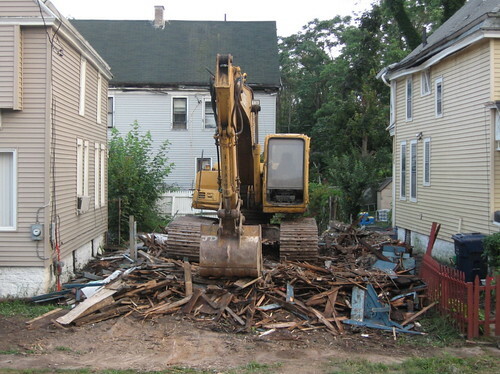 While chatting with Rod McCallum - Queen City Farm and Michael Gainer - Buffalo Reuse this week they were both mentioning that demolition activity was picking up. The other morning I snapped this pic of two City owned houses on Michigan Avenue near Northampton being prepped for the landfill. Went back a few days later and noticed this, left behind. Many demoliton sites that I've visited over the years have the odd children's toy still kicking. This tin drum from the Wollenberg site is my favorite and is coupled with an equally prescient line from Günter Grass. If you haven't checked out Peter Koch's Artvoice cover story about Transfiguration Church and you're interested in how we manage to collect amazing heritage and significant architectural sites and literally flush them away, read - Fall From Grace. Since the story first emereged a week ago I've attended a number of receptions and gatherings at various churches on Buffalo's East side. Folks, including a few priests, have approached me and shared stories about how less than transparent Buffalo Disocesen leaders have been in dealing with the various issues swirling around church closings or as Orwell might suggest - Journey Through Faith and Grace. Peter's story relies in part on the amazing work of Toronto based photographer Sean Galbraith. Sean's slide show is a must see if you're interested in the intersection of urban erosion and the marginilization of Buffalo's central european heritage. Over breakfast last Fall, Sean introuduced me to the work of Chilean born photographer/sociologist Camilo José Vergara (1944 -) that I last wrote about, right here in April 2007. One of my favorite Vergara sequences is located in Camden, NJ. 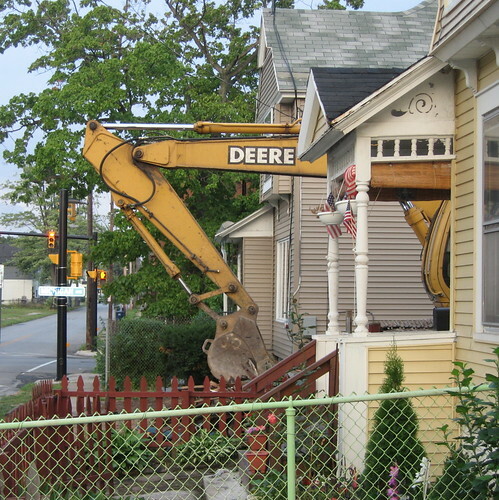 Riding home the other day, noticed that one of my favorite houses here in the Artspace Backyard neighborhood has been levelled. Dust. The City has owned 93 Riley for years. 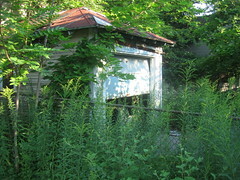 Click into the pic from June and you'll see the neglect on the utility pole. When I spoke with some neighbors, they were happy to see it gone. Side view. 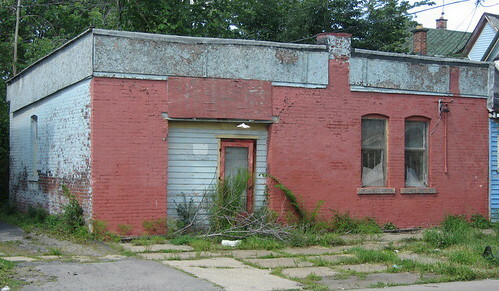 93 Riley - pic from June - part of a row of three little places, was structurally sound. Needed some love. Next day it's gone. Been exploring the dynamic of being "tourist in my city" with various people and places this summer and continuously amazed with what is revealed in the Queen City. The approach is different from the dates, times and places of history. Developing a relationship with the built environment and taking steps to see what's always been standing is a total trip. So much exists in the shadows and emerges, only if you are looking. Try Lafayette square at dusk on a warm summer night as the sun is setting behind city hall. 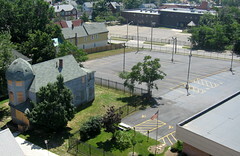 Some additional views of the immediate Artspace neighborhood include the Ward House on the left and Delware Avenue's Campanile on the right. Still love MJ's series especially this one with mayhem, Burnham and Yamasaki. What I - along with some of my readers, too I imagine - consider to be some of my best posts will be archived here. If you haven't subscribed yet, consider doing so over on the right hand side. Buffalo's Control Board Secretary/Treasurer, Rev. Richard Stenhouse is due in Housing Court again this morning at 930am. fixBuffalo readers may remember he did not show-up last week. This morning at 8am I visited the properties on Michigan Avenue, directly across the street from the new permanent home of Performing Arts HS, with a neighbor to see the past week's progress. Fingers were crossed that the properties were at least boarded and secure. 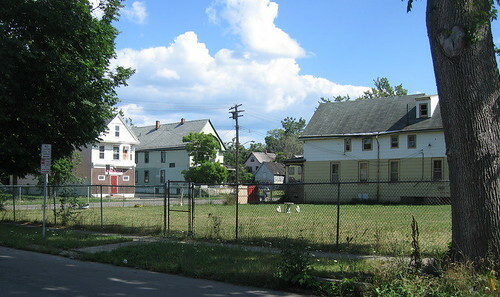 The secretary-treasurer of Buffalo’s control board has assured the city that crews will soon tear down some decaying vacant properties owned by his not-forprofit group. A judge has ordered the Rev. 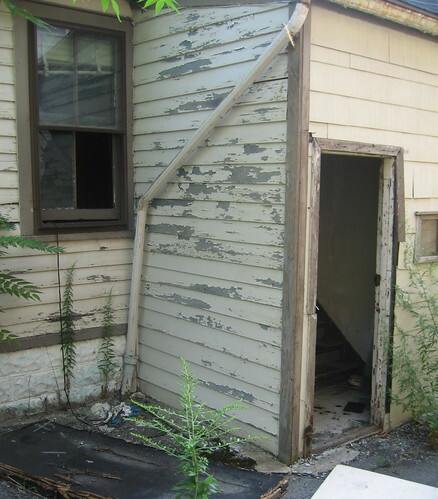 Richard A. Stenhouse or a representative to appear in court today to address code violations at four structures on Michigan Avenue between East Ferry Street and Woodlawn Avenue. Greg Zini was asked by Judge Nowak what Bethel's plans for the properties included. And as we learned from Brian Myers BN article this morning the church plans to demolish the properties. Greg confirmed this and reported that Bethel has one bid and is looking for additional bids from other demo contractors. I asked Judge Nowak to ask Bethel to secure the properties. Judge Nowak reminded Bethel's attorney that it would be less expensive if Bethel did the board up as the City would end up billing the Control Board Treasurer for the expense. The City's representative said the Mayor's Impact Team was overwhelmed with their current case load. 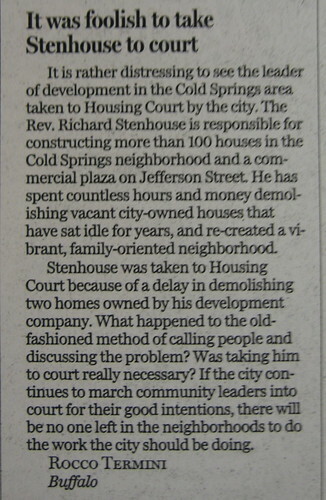 Noticed the BN reporter Brian Meyer has a new article about this morning's Housing Court case...right here. Just received a set of pix from Saturday's Tour d'Neglect. Wenton a 10 mile bike tour this weekend, of Buffalo's East Side. It was named "Tour d' Neglect", and it was led by an activist and preservationist who is very involved in the area. We saw a lot of nice architecture - buildings and churches, which are abandoned and crumbling as years go by... because it is not being cared for, and they are located in such a run down and poor part of the city. Next tour, Saturday August 18th. See our City like you've never seen it before! While walking the Masten neighborhood the other day I stumbled upon this spot for the first time. Learned from the neighbors that way back in the time machine this place used to have horses, buggies and morphed into a machine shop during the 30's. 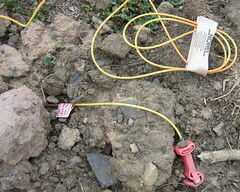 It's connected to this - right here. The owner of this spot lives nearby. I asked her about the neighborhood. She first arrived 60 years ago and told me that the corner here used to have two additional two-family houses on Masten, a 12 unit apartment building on Northampton and another two family house on Northampton - opposite the livery/machine shop building. Another neighbor told me about the commercial traffic on Masten, back in the day. Every corner from Best to Main had neighborhood bars, serving fish frys and deli's that everyone would walk to. Today there are only two commerical spots on Masten between City Honors and Main Street, a barber shop and a seriously sketchy corner store. Everything else has been swallowed by the urban prairie. See, just a block away.